Which would be a problem if Dear Esther was a video game. What began in 2008 as a mod for Half-Life 2 has, after years of picking up first buzz and then critical acclaim, transformed in 2012 into a full-blown commercial release, with all the updated visuals and polish to go along with it. Dear Esther drops you on an island in the Hebrides, off the coast of Scotland. Once there, you walk around. Very slowly. Every once in a while, as you make your way around the island exploring its paths and hillsides and trails, you'll be interrupted by a narrator providing you with increasingly fragmented and confusing accounts of yourself, your wife and then...other stuff. Gorgeous. I've seen the ageing Source Engine do some neat tricks before, but I have never seen it look as good as it does in Dear Esther. For an island almost entirely devoid of life everything looks, well, alive, and the lighting effects used for the weather and inside caves is stunning. A Novel Concept. You've probably never played anything like Dear Esther. The way it takes the medium of video games, rips everything out then takes the remaining husk on a walk for a bit of a chat was the reason people went mad for this as a mod, and nearly four years on it's still a refreshingly unique idea. Even if you hate the story, hate the setting and hate British motorways, you should still applaud a game that tries to do something truly unique. WHY: Even if you don't like the content, the structure and design on display here is still something you need to experience. Type of game: First-Person Island-Wandering / Story-Listening. What I played: Took around two hours to play through all chapters to completion. This is a beautiful, if not video game, then thing. It's a brave experiment, and the world always needs more brave experiments. It's occasionally too self-indulgent at the expense of the "player". I just didn't find the story and mystery on offer terribly interesting. Wordy Wordsmith. Yeah, you can give indie games a little slack for being over-eager on the use of a thesaurus, but there are moments in Dear Esther where the narrator becomes almost comedic, so intent is he (well, the script) on searching for words longer than four syllables for what feels like the sake of it. Walk Like a Man. It's a definite design decision to not only skip the inclusion of a "run" button, but to make your regular walking speed nice and slow. You're supposed to do this properly, walk each step as you would in real life, actually explore every inch of the island. It's also because walking triggers randomised narration fragments, and skipping or running would spoil this. But a lot of the island is boring. And if you end up at a dead-end and are forced to backtrack, it can feel like water torture, drip by drip, step by step. Not a Game. Here's where Dear Esther will fall down for a lot of people. There's just nothing to do. You walk, and see things, and listen to the narrator, but you can't interact with or pick up or affect anything. So all that's keeping you moving is the story (which will not be for everyone, myself included) and some nice visual effects. If you don't dig the story, there's almost nothing left. Dear Esther should be applauded for prioritising story over all else, and for taking bold design decisions that adhere to that vision. My problem is that its vision is perhaps too bold, and that by positioning itself as a video game it's actually doing itself a disservice. The story here may have been better left at just that, a story, because having the player trudge through it one step at a time - even if that was the idea, to better immerse them - often feels like a forced march instead of a journey of discovery. Especially when there's almost nothing to do while on that journey. In other words, this is a book. An audio book, if you will, in which your mouse and keyboard are as "gamey" as your fingers are when turning the page of a novel. So, yeah, I didn't like this as a game. I didn't really like it as a story, either. But you know what? Who cares. 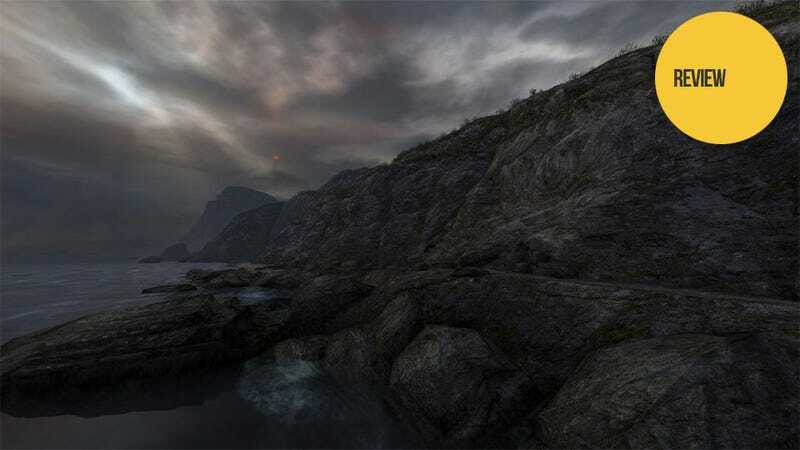 There's promise here in Dear Esther's structure, if not its execution. You've likely never played anything like Dear Esther before, something which goes against almost everything you think you know about how a "game" should be designed and played. So if you're at all interested in seeing how games could be if they put the guns down and just started talking, you should at least check it out.